So, first, I will tell you about our xmas holiday. Since we do not have our container, we do not have any of our Christmas decorations. 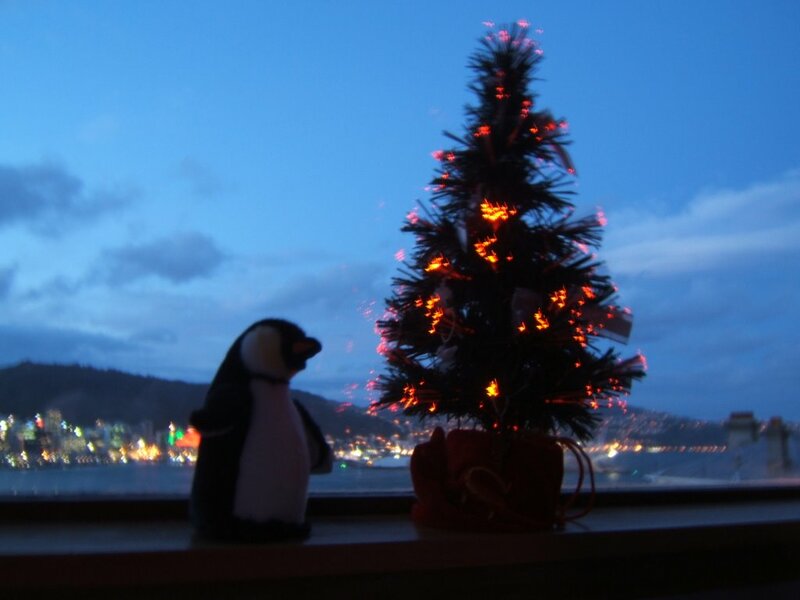 To have some sort of festive spirit in the house, Darren went to the Warehouse (NZ version of WalMart, minus the evil) and bought a little 13 inch tree with fiber-optic lights. We put it on the windowsill next to Fred and our presents below on the floor. The big present is from work (it turned out to be a platter). We "trimmed" the tree with the decorations Darren bought, as well as the "trim" Heather and Amy gave us at my wedding shower. What else would we do with trim? On Christmas Eve day, we went to a special showing of Lord of the Rings: Fellowship of the Ring (extended version) at the Embassy Theater , where the movie originally premiered. The Embassy is a beautiful old 1920's cinema that was refurbished for the premier. The seats are very comfortable, and the sound is amazing! 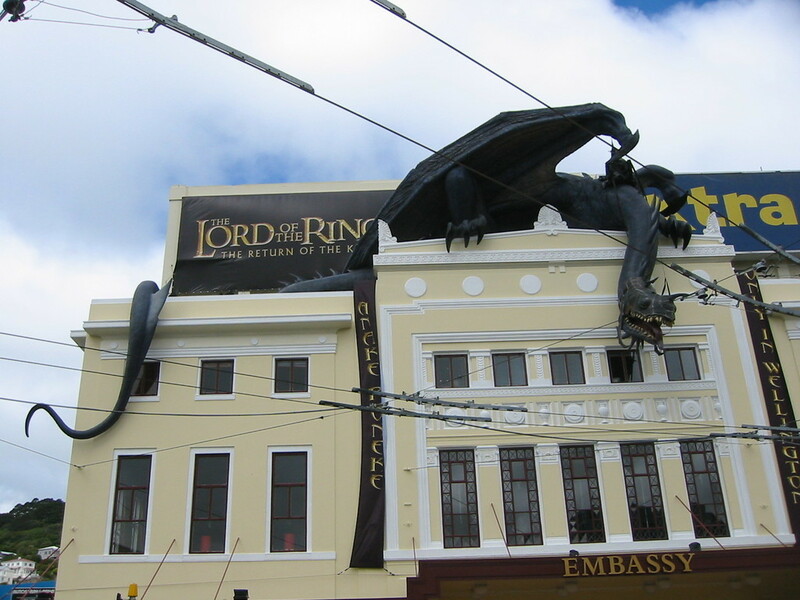 And because most of the residents of Wellington disappear over the Christmas/New Year's holiday, the theater was practically empty. The only trouble with most of Wellington shutting down for the holiday, is that most restaurants also close down between Christmas Eve and the 3rd of January. Part of that is also due to the new law that mandates higher wages for employees on public holidays. So, we went home and scrounged for food. 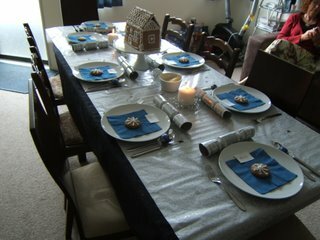 The next morning, we opened our gifts and ate breakfast. That took up about 10 minutes! No worries, as Darrel was arriving late morning to take us back to his house for Christmas dinner. When we arrived, the table was already set according to Merrin's theme this year - silver, white and blue. We chatted with her brother and mom, and once Darrel's parents arrived, we sat down to a dinner of turkey and ham, tons of vegetables and really yummy bread. Dessert was a very fancy chocolate fountain with fruits and marshmallows for dipping. Once we were all fat and happy, we sat down to chat some more and play Cranium. I had never played before, but it didn't take long to get the hang of it. Of course, we had a bit of trouble, as it was not an American version (one of the questions had Darren drawing something to do with Cricket - I had no idea what the hell I was looking at!). And forget trying to spell anything backwards or forwards after three glasses of wine! That evening at home, we looked out on the city, and noted that fog was covering a good portion of the buildings. Due to the city lights, the fog had a glow, almost like the reflection of a thick blanket of snow...it felt like Christmas. 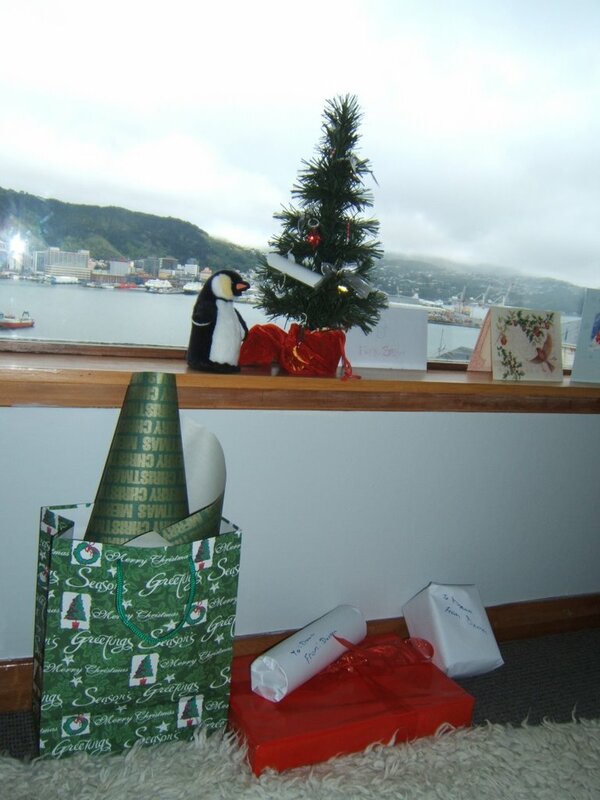 Maybe next year we'll do a traditional Kiwi Christmas on the beach....and/or a BBQ. Ooooo... awesome gingerbread house. Hope it was tasty. On to New Year! Which you will, of course, be celebrating before us.